According to a U.S. intelligence assessment, the ‘Poseidon’ has been tested 11 times to date. The nuclear-capable underwater drone “Poseidon,” alternatively referred to as an unmanned underwater vehicle (UUV), autonomous underwater vehicle (AUV), or simply an intercontinental-range, nuclear autonomous torpedo, is expected to enter service with the Russian Navy by 2027, sources familiar with a U.S. intelligence assessment told CNBC this month. Additionally, the U.S. intelligence assessment reportedly notes that the 11th and last-known test of the Poseidon underwater drone was carried out in November 2018. U.S. intelligence also posits that the Poseidon’s nuclear propulsion system has not been tested to date, contradicting Russian statements that sea trials of the new weapon system, including tests of the propulsion system, are currently ongoing. Notably, Russian sources stressed over the last months that the ongoing tests are not full-fledged sea trials and focus on the Poseidon’s guidance system and underwater operations in autonomous mode. The drone is listed in Russia’s state armament program for 2018-2027 and is expected to be delivered to the Russian military in the late 2020s. The Russian Navy is expected to receive up to 30 Poseidon UUVs. 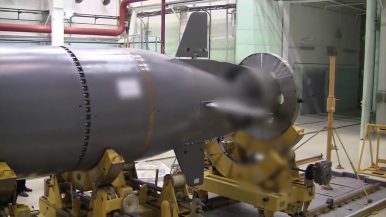 According to Russian reports, the Poseidon can purportedly be fitted with a thermonuclear warhead yielding about two-megatons. A B-90 Sarov-class Project 20120 diesel-electric submarine has reportedly served as the Poseidon’s principal launch platform in past tests. In February, Russian President Vladimir Putin stated that the “first nuclear-powered submarine armed with this unmanned vehicle will be launched” in the spring of 2019. This submarine, purportedly the Project 09852 sub Belgorod, based on the 949A Oscar II-class nuclear-powered guided missile submarine, will join the Russian Navy in 2020. The Poseidon UUV can reportedly also be launched by the new Project 09851 submarine, a downsized variant of the Borei-class nuclear-powered ballistic missile submarine. The two different submarine types will purportedly be capable of carrying four to six Poseidon UUVs each. Russian sources also stated that a total of four Poseidon-carrying submarines are expected to enter service with each sub carrying up to eight Poseidons bringing the total number of UUVs to 32. The Poseidon program was first revealed to the public in September 2015. It is unclear whether the Poseidon will serve only as a nuclear-warhead delivery platform or can also be deployed for intelligence, surveillance, and reconnaissance (ISR) missions.